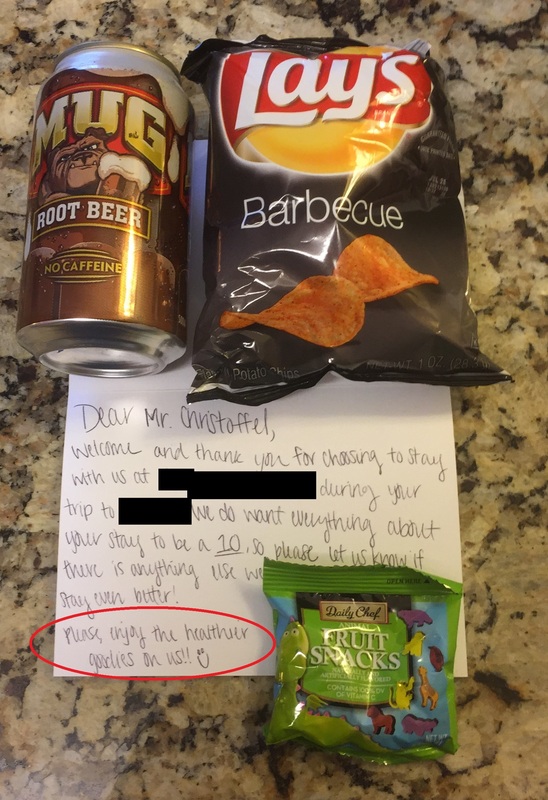 On my way out of town recently I received a call from the property I was staying at asking me what kind of snack I would enjoy. I suggested something healthy like a piece of fruit, water, nuts, etc. When I made it to my room, a gift bag awaited me with a snack. In the note she hopes I enjoy my “healthier” snack. While I appreciate the companies attempt at doing something nice for a customer they have a bit to learn around nutrition. Artificial flavors, high fructose corn syrup, GMOs, MSG, fried in oil, artificial colors and a few unknowns make up this clump of “healthier” snacks. If I were to serve you these snacks it would be because I did not like you. I laughed and laughed having it confirm for me once again that many folks perceptions of healthy was nowhere in line with what is. Root beer, BBQ potato chips, and fruit chews don’t quite hit the mark but am guessing the word fruit made her think healthy. At one time, I too might have thought of anything having the word fruit in it as being healthier. When traveling if one hasn’t brought their own stash of sprouted and raw nuts, fruit, veggies, etc. then it can be hard to grab something healthy if not nearly impossible. At least today most gas stations and convenience stores now carry bananas and some assortment of nuts/seeds and water. Here is hoping you have an amazing 4th of July weekend and may the healthier choices you make be in line with what is important to you. May all of our watermelons be sweet and feel free to share this with most anyone. The Nutritional Truths audiobook is in post-production and will be available mid-July. Thanks & Be well!